Maps of the whole of Scotland show the changing shape and geographical knowledge of Scotland over four centuries. Includes famous maps of Scotland by leading cartographers such as Gerard Mercator (1595), Joan Blaeu (1635 and 1654), Hermann Moll (1714), James Dorret (1750), John Ainslie (1789), and Aaron Arrowsmith (1807). Also includes thematic maps showing features such as administrative boundaries, clans, geology, railways and roads. County maps of the regions of Scotland show the best detail of rural areas up until the 19th century. 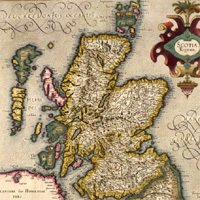 Includes the earliest detailed mapping of Scotland by Timothy Pont, and all the major county atlases of Scotland, including those by Joan Blaeu (1654), Hermann Moll (1745), John Thomson (1832), and John Bartholomew (1912). 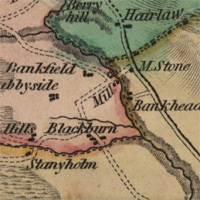 County maps by private surveyors based on trigonometrical surveys were made of most Scottish counties between 1760 and 1840 . Also includes Scotland's first road atlas by George Taylor and Andrew Skinner (1776). Town plans of the main settlements in Scotland, show the best detail of urban areas up until the 19th century. 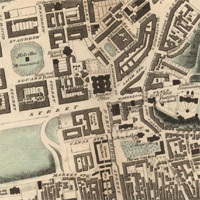 The earliest town plans were often bird's eye views of places such as Aberdeen, Dundee, Edinburgh and Glasgow from the 17th century. Most smaller towns were not surveyed until the 19th century, often by private surveyors such as John Wood. The Great Reform Act (1832) resulted in plans showing boundaries for 75 towns, and very detailed Ordnance Survey large scale town plans (1847-1895) were published for 62 towns. Sets of maps / topographic series by Ordnance Survey, the Admiralty, and Bartholomew. 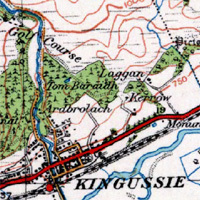 Ordnance Survey maps provide the most detailed coverage of all places in Scotland from the 1840s to the present day. Includes the Ordnance Survey one-inch to the mile maps providing a regional overview, more detailed six-inch to the mile maps for showing all aspects of the landscape, the 25 inch to the mile maps covering populated places in great detail, and air photo mosaics, 1944-1950. 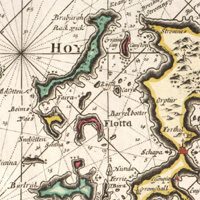 Coastal charts of Scotland focus on nautical information for mariners, and show often unique information on coastal settlements, islands and ports. Includes charts by Nicolas de Nicolay (1583), Greenvile Collins (1689-1693), John Adair (1703), and Mudoch Mackenzie (1775-6). During the 19th century, the Hydrographic Office of the Admiralty (1795-1904) surveyed all the coasts of Scotland in great detail, often updating charts regularly for busier ports and estuaries. 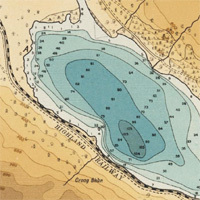 The Bathymetrical Survey of the Fresh-Water Lochs was the first comprehensive examination of the depths and nature of 562 inland Scottish lochs, and shows 60,000 soundings on 223 coloured maps. The work was a private initiative by Sir John Murray and Lawrence Pullar, with distinctive layer-coloured maps published by Bartholomew. Also includes a complete transcription of the accompanying textual volumes, with detailed scientific and descriptive information on Scottish lochs. Maps made for military purposes, showing battles, lines of attack and defence, fortifications, enemy positions and wartime reconnaissance. 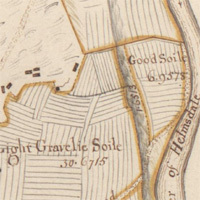 This includes Military Maps of Scotland, made primarily by the Board of Ordnance in their attempts to construct, defend and repair Hanoverian castles and forts from the Jacobites. 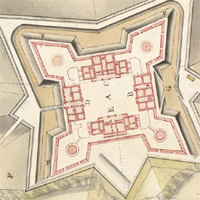 The Roy Military Survey of Scotland (1747-55) is the most detailed map of all of mainland Scotland in the 18th century, and was a direct response to the 1745 Jacobite uprising. William Roy's Military Antiquities of the Romans in North Britain (1793) is one of the earliest archaeological works on the military conquest of Scotland by the Romans with 51 detailed maps. Our initial online set of estate plans focuses on the earliest detailed maps of Sutherland. It includes John Kirk's Survey of Farms in Golspie and Loth (1772) and John Home's Survey of Assynt (1774), the earliest detailed plans of these Highland parishes. It also includes a small set of Edinburgh feuing and land-ownership plans, 1801-1878.